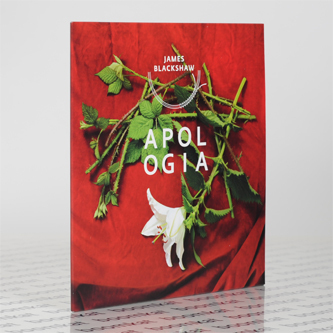 *Edition of 500 copies* "Apologia is the 'lost' first solo guitar album by James Blackshaw from 2003, which he self-released on CD-R in an edition of 30. As Blackshaw explains: "Apologia’ was written on a cheap Yamaha guitar with a ridiculously high action over the course a couple of months in 2002 and recorded in February 2003, a few months before I picked up a 12-string guitar for the first time and wrote and recorded my first release, ‘Celeste’. I’d just started fingerpicking and had gotten comfortable enough with some techniques to experiment with open tunings of my own devising and write my own compositions, which were at that time very inspired by the musicians I adored - John Fahey, Robbie Basho and lots of old country blues players like Mississippi John Hurt, Blind Blake and Reverend Gary Davis. I burned about 30 CD-Rs with homemade covers in jewel cases, gave most to friends and family and sold a few in the record shop I used to work in Soho. I felt for some time afterward like I was only just starting to find my own voice with ‘Apologia’ - the songs are shorter and more straightforward and the cyclical structures and appreciation of drones and overtones really came to the fore later on, as did my appreciation of adding other instrumentation and experimenting with sounds generally. Plus, I wasn’t entirely happy with the sound of the recording (some small EQ changes and reverb was added for this edition) and let’s just say the situation in the studio was far from ideal, but that’s another story. For that reason, I never chose to reissue ‘Apologia’. Now, almost 12 years later, I’m hearing them in a different way, realising the songs' charms rather than simply concentrating on the flaws. It doesn’t sound quite like anything I’ve ever done since and there’s a simplicity and raw energy about them that I’ve grown to appreciate. It’s an interesting snapshot of where I was then and how things have changed. It is an absolute pleasure for me to work with Bladud Flies! to release ‘Apologia’ as a limited edition LP now - something I would never have dreamed of back in 2003." - James Blackshaw."